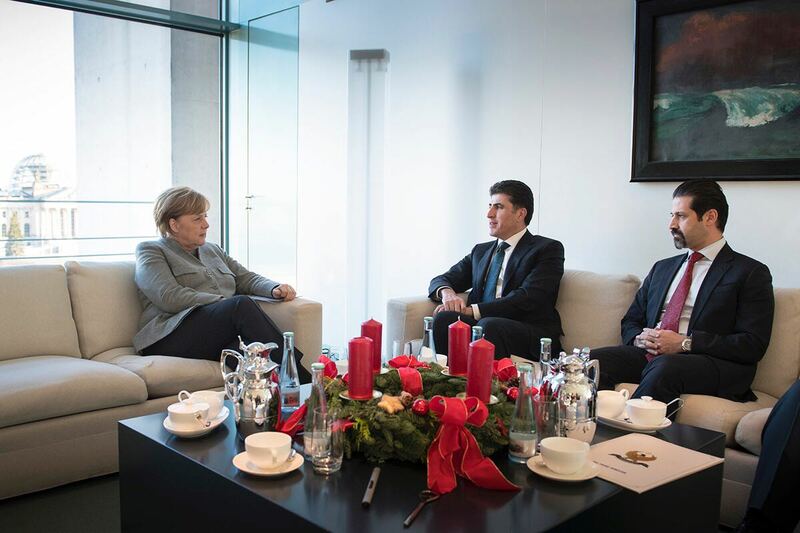 Erbil, Kurdistan Region, Iraq (cabinet.gov.krd) – A senior Kurdistan Regional Government delegation, headed by Prime Minister Nechirvan Barzani, is in Berlin and met with Germany’s top leaders, including the country’s chancellor, Angela Merkel. Prime Minister Barzani thanked Chancellor Merkel for the support and assistance that Germany provided to the Kurdistan Region, and briefed her on the latest developments of the relations between the Kurdistan Region and the federal government of Iraq. Prime Minister Barzani stressed that the Kurdistan Regions is committed to the Iraqi Constitution and is ready to negotiate with Baghdad to resolve all issues within the framework of the Constitution. Prime Minister Barzani said, despite KRG’s readiness to negotiate, Baghdad has not responded to his government’s call for dialogue. Thus, the Kurdistan Region’s friends in the international community, including Germany, are urged to help and facilitate negotiations. Chancellor Merkel voiced her country’s support to the Kurdistan Region’s constitutional rights within Iraq and shed light on Germany’s relations with the Kurdistan Region and the assistance it has provided to the Region, especially during the fight against terror. She also commended the Kurdistan Region for its readiness to hold negotiations with the Iraqi Government. Prior to his meeting with Chancellor Merkel, Prime Minister Barzani met with Germany’s Minister of Foreign Affairs Sigmar Gabriel and held a joint press conference afterwards. Minister Sigmar stated that Germany has worked with the Iraqi federal government and the Kurdistan Region to fight and defeat the so-called Islamic State terrorist organization, which posed a threat to the entire world. He thanked Iraq and the Kurdistan Region for defeating ISIS. Germany’s chief diplomat also called on Baghdad to accept the dialogue initiative, stressing that Germany supports solving issues between the Kurdistan Region and Baghdad through negotiations. Prime Minister Barzani thanked Germany and the international anti-ISIS coalition for supporting the Kurdistan Region and Iraq during the difficult times through sending weapons, military advisors, training the Peshmerga and treating the wounded in Germany. He also thanked Germany for the humanitarian aid it has provided to the IDPs and refugees in the Kurdistan Region, particularly Germany’s GIZ organization that initiated and supported many humanitarian projects in the Kurdistan Region. The Kurdistan Region delegations also met separately with the Bundestag’s Foreign Relations and Defense committees. In the meetings, German lawmakers applauded the role of the Kurdistan’s military, the Peshmerga, in the fight against terror and also expressed concern regarding the tensions between the Kurdistan Region and the federal Iraqi government, hoping that all disputes are resolved through dialogue and on the basis of the Iraqi Constitution. 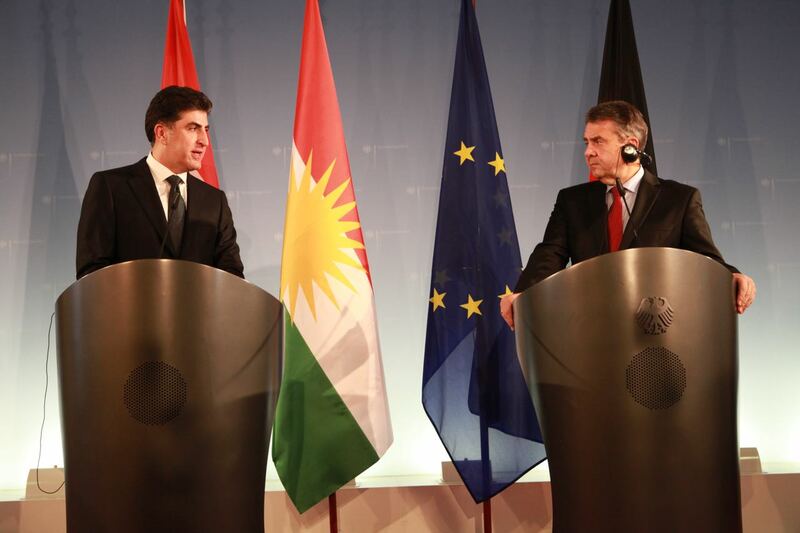 They also voiced their support for a strong Kurdistan Region and its political process. Prime Minister Barzani thanked the Bundestag for their decision to send military support to the Kurdistan Region and hoped that relations between the Kurdistan Region and Germany further develop in all fields. Deputy Prime Minister Qubad Talabani, Chief of Staff to the Kurdistan Region Presidency Fuad Hussein, KRG Spokesperson Safeen Dizayee, and Head of KRG’s Foreign Relations Department Falah Mustafa are accompanying Prime Minister in his visit to Europe.